This morning we were excited to have our first cups of homemade coffee in almost a month. It was perfect! Some habits never die and why should they, when a solution such as this was generously provided by our thoughtful hosts? Yesterday, Saturday here in Australia, was a very good day. That's not to say that generally speaking most days aren't good. They are. But, some days have a special quality that leaves us with a smile on our faces for those unexpected little treasures in life. Yesterday was such a day. In the morning, our hosts and property owners, Sylvie and Andy sent us a message saying they were coming to clean the house at 8:30. Early birds that we are, the time was no problem for us. We'd be up since 6 am. Our landlords, neighbors and new friends, Sylvie and Andy. 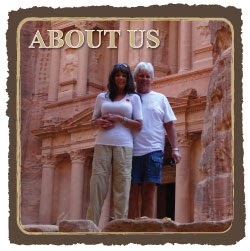 Sylvie is from France and Andy is from the UK and have lived in Australia for over 20 years. They offered to wash and dry the sheets, remake the bed, wash the towels and clean every inch of space. Wow! That was an amazing offer. However, we'd already done the sheets on Thursday, one week after the day we arrived, all the towels were already in the wash and, the prior day I'd swept the floors and dusted the shelves. The bathroom and kitchen were already spotless since we clean as we go. When we arrived we'd inquired as to a cleaning person coming once a week to do the entire place for which we'd pay the cost, if it wasn't too much. With Sylvie and Andy busy working all week, we didn't want to pester them about a cleaning person, instead doing everything we could with the cleaning products we'd purchased; bathroom and toilet cleaner and Windex along with a broom and dustpan we found here. Tom's dinner last night, included one pork chop, three gluten free cheese sausages, one gluten free knockwurst on a bed of sautéed onions and mushrooms, a side salad and a muffin with New Zealand grass fed organic butter (muffin not shown). Tidy folks that we are, on any day of the week, there's few areas that require cleaning. The only area of concern were the floors which we'd swept almost daily. After over a week of cooking and then eating in the dining room, even after we'd swept the floor several times, it could easily do with a good washing. Plus, the area rug was covered in bits of white lint that I'd tried to sweep to no avail. I hesitantly asked that they only do the floors and the rug. At 8:30 sharp they both showed at the door with vacuum and mops in hand. We felt awkward letting them do the work but, they insisted. They explained that any other guests renting the property didn't have to clean when they stayed for shorter periods. Tom and I moved outside to the veranda while they worked. About 30 minutes later Andy stepped outside, done with the work, to join us for lively and animated conversation that we thoroughly enjoyed. Going forward, they'll do the floors and we'll do the rest, a fair and easy compromise for all of us. My dinner last night included two lamb chops, two gluten free cheese sausage, one gluten free knockwurst on a bed of sautéed onions and mushrooms, a salad and a low carb muffin with grass fed New Zealand butter (muffin not shown in this photo). A short period after Andy left, he excitedly joined us outside again, holding his tablet anxious to show us an online photo. He'd found a coffee pot, an actual drip coffee pot! And above all, he was driving to Cairns to buy it for us to use. Although we hesitated for a moment, not wanting them to spend the money, Tom and I looked at each other, both agreeing it would be greatly appreciated. It made no sense for us to buy a coffee pot that we'd have to leave behind. However, it could be a valuable item for them to include for future renters. As Tom and I busied ourselves during the day with our usual this and that, the day flew by. While I was in the kitchen making my usual 4 pm mug of hot tea, Sylvie and Andy showed at the door inviting us to their home above us. They'd purchased the coffee pot and wanted us to bring our bottle of "thickened cream" to give it a try at their house and then we could bring it downstairs for our use during our remaining time in their lovely property. The sunrise from our veranda yesterday morning. We'd yet to see their exquisite modern home and couldn't help but ooh and aah over their beautifully designed, decorated and appointed home. The view, one story up, was all the more enchanting. Sitting on their veranda we thoroughly enjoyed "happy hour" together, until finally, we had to leave when the mozzies came out in full force and it was time for us to go back downstairs to make our dinner, all of which I'd set up earlier in the day for a quick final cooking. I prefer to prepare as much of a meal earlier in the day so that when hunger hits us, the final prep is quick and easy. As we were about to leave Sylvie handed me a bucket filled with cleaning supplies, a bird book and a set of measuring spoons for baking the few low carb muffins we make from time to time. Check out the photos below. This is the bucket of cleaning supplies Sylvie and Andy gave us for our use and also measuring spoons and a bird book. After the excellent dinner for which we've included the above photos we settled in for the night watching an episode of America's Got Talent, a highly smile-worthy show that we've watched for years. Using the HDMI cable daughter Tammy had given us at Christmas which we plugged into the high def TV we enjoyed almost two hours of light hearted pleasure. 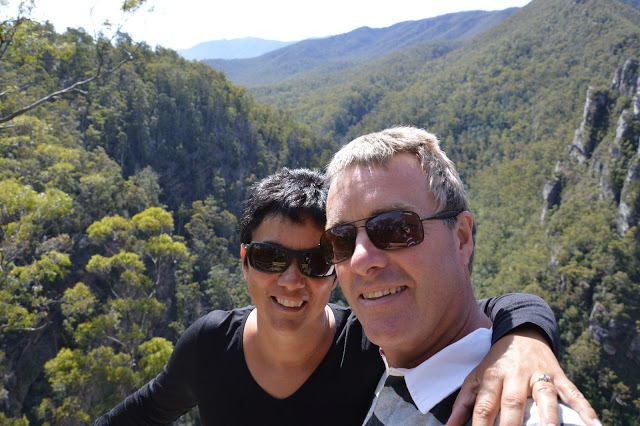 We are grateful for our lovely property owners, Sylvie and Andy, for adding so much to our experience in Trinity Beach, for their kindness and friendship which surely we'll treasure now and well into the future. Happy Father's Day to those dads who are in our current time zone where it's Sunday! This Bottle Brush plant and its unusual colors particularly appealed to us as we drove through the mountains of Madeira. For more details, please click here. Yay, coffee! I know it was a great touch and treat! Staci, thanks for enjoying coffee with us! I'm sitting here right now with my first mug of coffee with "thickened cream." Delicious! Tom's drinking his without sugar, just adding the cream. He's lost 15 pounds in the past few weeks eating my way and without sugar in the coffee which makes all the difference in the world. Hope you and Glenn are doing great. Thanks for writing! Hey! Congratulations Tom! I KNOW how hard it is to lose weight. I admire your approach and I expect the support from your amazing wife also goes a long way. Hope you and Dave are doing great!